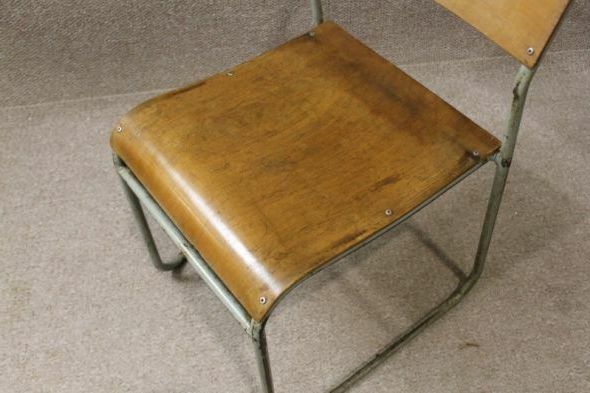 These beautiful metal and plywood stacking chairs are of a classic design from the early 1950’s. They are in excellent condition for their age but as expected there are some signs of general wear and tear being as they were used on a daily basis. These chairs are extremely comfortable with their shaped plywood seats. The chairs as the title suggests can be stacked to save space on storage. These plywood stacking chairs contrasts a blue/grey painted metal steel frame and a plywood seat and backrest, ideal for anywhere with similar interior/retro look, cafe or restaurant. We have quantities available so please call 01543 375872 for details.